When it comes to my childhood, there's one regret that I have... that I never learned to play the piano. Sure, I was musically-inclined (I played the trumpet, tuba and drums), but the piano is a classic instrument that you can play in virtually any home (most homes have a piano). At one point as a young adult, I tried learning to play the piano on my own, but that didn't work out so well. Believe it or not, this is where Apple's GarageBand app can help (yes, GarageBand). GarageBand is an app for Mac that primarily allows you to record and edit tracks of audio. Most people don't know that GarageBand is also a great tool for helping you to learn instruments (specifically the piano and guitar). When you open GarageBand, you will be asked what kind of project to create. Rather than creating a new project, you'll want to click on the "Learn to Play" tab on the left side. 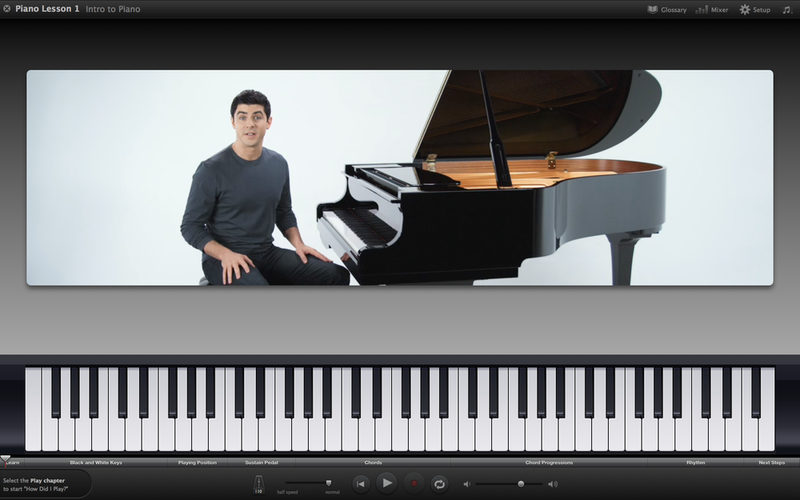 The idea is that you use your iMac or MacBook Pro next to the piano so that you play as you learn. A midi-connected keyboard or piano would be the best option since it can give the lessons direct feedback as you learn, but if you don't have a midi-compatible piano, a traditional piano works as well. When you're ready for more, click on the "Lesson Store" tab to download more lessons. When you've begun to master the basics, you can download even more lessons specific to learning to play like Mozart, Bach, Beethoven and other great classical artists. Again, these lessons are all free! When you're ready to learn to play like modern-day artists like Sarah McLachlan, Ben Folds, Sara Bareilles, Norah Jones, John Legend, OneRepublic and others, there are paid lessons available for $4.99 (at time of post) each. The same type of lessons are available for those wanting to learn to play the guitar. No matter how you look at it, GarageBand is a great resource if you're looking to learn how to play a new instrument. Check it out! Posted on May 19, 2014 by Kevin Allgaier and filed under How To, Mac, Opinion.